Home>Hand Protection Products>Coated, Laminated & Dipped Gloves >North® NF11HD NorthFlex Cold Grip™ Winter Lined Gloves/Sold by the pair. 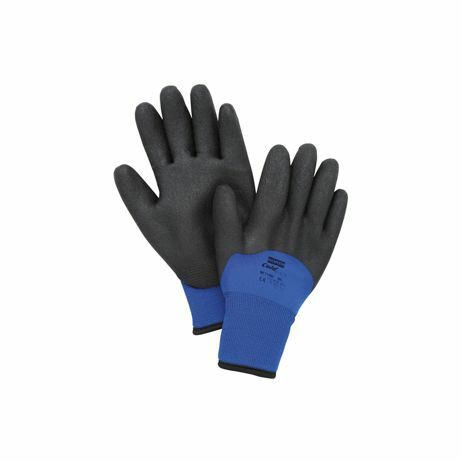 North® NF11HD NorthFlex Cold Grip™ Winter Lined Gloves/Sold by the pair. NorthFlex Cold Grip™ represents a new generation of cold-conditions gloves that provides a highly comfortable feel as well as superior insulation. It is ideally suited to tasks where workers need protection from the cold, but dont want to give up comfort and dexterity. Seamless brushed synthetic liner is comfortable and provides insulation from the cold. | PVC coating extends to the knuckles to provide liquid protection. | Coating is foamed to give excellent dry and wet grip. 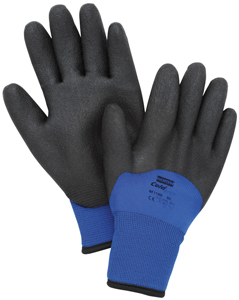 | Glove retains flexibility, even at low temperatures. | Recommended for temperatures down to -15ï¿½F (-26ï¿½C)*. | Launderable for added value and longer life.